WEST PALM BEACH, FL--(Marketwire - April 24, 2008) - As oil and gas keep hitting new records this week, an electric car dealership opened in West Palm Beach, Florida offering a new affordable design for city-speed driving called the ZAP (OTCBB: ZAAP) Xebra. 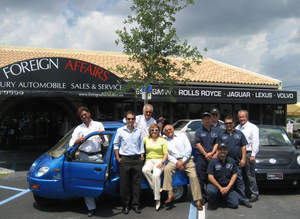 Foreign Affairs Auto (http://www.foreignaffairsauto.com), located at 1681 N. Military Trail in West Palm Beach, is now offering the Xebra®, an electric four-door compact car or two-seat pickup that transforms into a flat-bed or a dump truck. The vehicle was designed for gas-free, city driving up to 40 MPH and plugs into any normal household outlet. Foreign Affairs officially launched its electric cars on Earth Day with the planting of a tree to signify another way to fight global warming. The dealership has already sold several Xebras in its test-marketing and finds that the majority of the initial sales are coming from businesses, with two of the first vehicles being used for landscaping and pizza delivery. More consumers have started buying them as they learn they are available and see them driving around town. Family owned and operated since 1982, Foreign Affairs is branching out into gas-free electric vehicles to stay on the cutting edge of transportation. Studies show electric vehicles can reduce air pollution and ownership costs compared to gasoline. The vehicles are priced a little over $11,000 and are estimated to cost between one and three cents per mile. ZAP says an electric car can reduce fueling, maintenance and operating costs, and overall they are about half the cost of owning a gasoline car. "My family started this dealership 26 years ago with the idea of offering a premium level of products and service," says Jonathan Ortiz of Foreign Affairs. "As part of the next generation, I believe the best way to reach the next level for our business is to get in on the ground floor of advanced automotive technologies. Our new division, Foreign Affairs: Zero, will be marketing vehicles like the ZAP Xebra."